Welcome to the future of clubhead design with Callaway's new Epic Flash driver. The clubface, known as Flash Face technology, has not been designed by humans. It has been created by Artificial Intelligence (AI), through machine learning. This is believed to be the first time that this has been used in golf clubface design. The upshot is that the uniquely different face, which has a subtle wave design, allows the golfer to get a greater ball speed at impact which makes the ball fly further for longer distances from the tee. The face itself has been forged from a special titanium which is heat treated for 2 hours to produce a flexible face with excellent strength properties. The clubhead has been strengthened by the use of 2 internal 'jailbreak bars'. This makes the crown and sole incredibly strong and stable placing a higher impact load on the face give a faster ball speed. The driver benefits from an adjustable perimeter weighting system with a 16-gram weight. This allows you to set it exactly where you want it to promote a draw, fade or a straight ball flight. As well as greater distance, this club is also very forgiving for those off centre strikes. Callaway have used a new, extremely light carbon fibre fabric known as T2C. This fabric has a very tight weave which saves weight. This weight has been moved within the head to give a higher MOI (Moment of Inertia) which gives the exceptional forgiveness we are after. This is further enhanced by the advanced head shape of the club. There is a choice of 3 premium shafts for this driver which come as standard. The Project X Evenflow shaft, the Project X HZRDUS Smoke shaft and the Mitsubishi Tensei AV shaft. A golf Pride premium Tour Velvet Align grip is fitted. This grip has a green ridge which is unique to this driver. This driver has really pushed the boundaries of clubface technology. The design on the face simply could not have been done by humans. It is the future. Make sure you are not left behind. 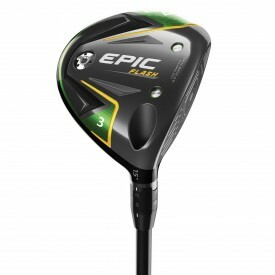 Order the Epic Flash driver from Golfsupport today. Choice of 3 premium shafts.